Glimpsing several cows through a fog on an unfamiliar road, one might wonder: “Just how many more cows are out there?” A similar fog obscures progress among unreached peoples. We know movements are multiplying. As through lifting fog, we can now see more than anyone expected! In the mid-1970s, many were stirred to pray for and go to an estimated 17,000 unreached people groups (UPGs). Attention later focused on the 10/40 Window. But breakthroughs were rare. Few Acts-like movements appeared, and apparent “progress” was largely due to better research. Today about 7,000 UPGs are listed as unreached.1 However credible reports of multiplying movements reveal that rapid change is coming! Since 1995, less than 25 years ago, multiplying movements of small, reproducing churches have brought 50 million to faith in Jesus, and equipped these new disciples to share their faith and disciple others. This is happening mostly among the unreached, and the pace is accelerating. Then in mid-2017, formation of the 24:14 Coalition3 deepened trust between movement leaders and researchers, and an unprecedented number of movement leaders shared their progress. Credible organizations and networks reported approximately 2,500 movement engagements,4 including nearly 500 movements5 that had produced millions of new disciples. As 2017 ended, the count was nearly 650 movements with 50 million disciples! 3 See 2414Now.net, and the Jan/Feb 2018 Mission Frontiers on the 24:14 Coalition. 4 Engaged with movement strategy, but not yet reproducing to four generations. 5 Based on credible reports of 4+ streams replicating to 4+ generations. 6 In the New Testament we see oikos (households) like Lydia’s believing together. 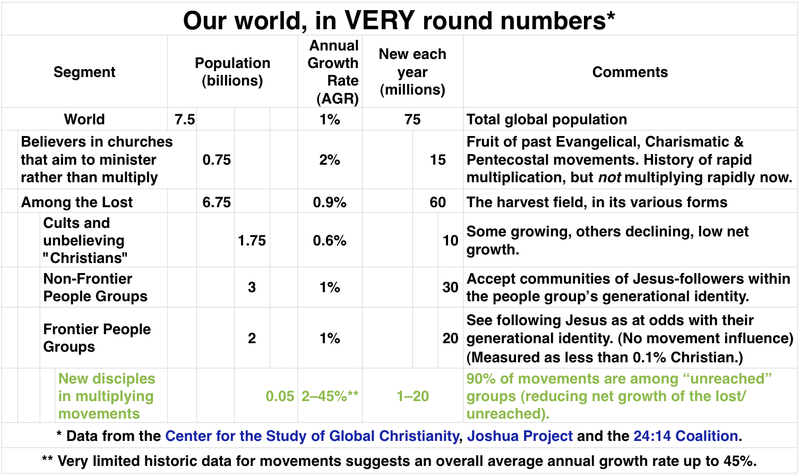 As in the first century, the ekklesia7 in movements multiply rapidly without new dedicated buildings. Those inclined to associate church with buildings can thus easily overlook the invisible reality of movements multiplying. 7 Ekklesia is the New Testament Greek word in Jesus’ declaration “I will build my ekklesia” (Mt 16:18). Four English Bibles before the King James translated this word as “assembly,” but the commission for the King James required translators to use “church” instead of “assembly,” apparently to delegitimize gatherings of believers outside the state-owned buildings. A few large, well-known, older movements go back 20 years or more, and have slowed in growth as they got bigger. However most movements are new, smaller, and growing much more rapidly. Well-intentioned outsiders can quickly derail a movement. Outside funding has killed off many budding movements. Unwanted attention increases persecution of movements. To date, about 15 known movements have fizzled. But most continue to grow exponentially, and some are multiplying to additional UPGs. Movements multiply ekklesia faster than they can be readily counted, and terminology and methods for tracking such movements are still emerging. Where onsite verification by a visiting team is impractical, researchers seek detailed reports and independent confirmation. In 1995: at least 5 full movements with 15,000 new disciples. In 2000: at least 10 movements with 100,000 new disciples. In 2017: at least 645 movements with 47,500,000 new disciples! And at least 90% of these movements are among UPGs! Thus, in recent decades, at least 1% of the global population of UPGs have become—not just believers—but obedience-oriented disciples in rapidly multiplying ekklesia! Thousands of more movements are still needed, yet there are many reasons to hope expectantly for the continued multiplication of movements. As movements expand, their growth rate usually declines. Saturation of population segments inevitably slows movements. Global attention could increase persecution and other inhibitors. Relocation and/or moral failure can remove key leaders. Further review of movement reports not initially deemed credible. Spirit-led progression of existing engagements into movements. Church planters learning to how to pursue movements. Traditional (visible) churches learning to start movements. Mobilization of more laborers to pursue movements. Increasingly effective movement training, with guided experience. Unprecedented learning from each other’s successes and failures. Spontaneous spread of movements to new peoples and places. Intentional multiplication of existing movements. Multiplied believers praying explicitly for movements. Further discovery of what God is already doing. 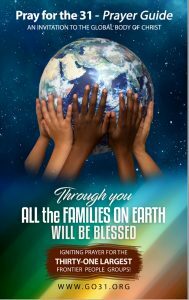 Aim to bless and disciple families/social units more than individuals. Raise up and equip natural leaders from within existing groups. Focus more on obeying Jesus than on accumulating knowledge. Disciple more by God-led discovery study than experts teaching. Cultivate maturity more through loving obedience than knowledge. Meet in private homes and public venues more than owned buildings. Average fewer than 20 participants in regular, interactive gatherings. Aim to multiply new ekklesia rather than grow in size. Employ simple patterns each disciple can facilitate and replicate. Involve disciples more in ministering than in receiving ministry. Work toward multiple new generations (not just daughter churches). Spread more through relational networks than attracting strangers. Prove more stable than churches of gathered strangers. Are invisible at first to outsiders and the surrounding community. Most believers since the first century have had no option but to live provincial lives—without opportunity to see the unfolding progression of God’s global purpose, or grasp our place in it. We have the unprecedented ability to view recent developments with historical perspective to anticipate what lies ahead. their testimony of Jesus’ life and work in their lives. Yet by 400 AD the church was centered in dedicated buildings and the annual growth of Christians had slowed to less than half a percent (.5%), where it stayed until the 1800s. By 1792, access to scattered reports of the religious state of the world stirred William Carey to write a short booklet—An Enquiry into the Obligations of Christians, to use Means for the Conversion of the Heathens,15 then set sail for India. Carey’s booklet and example stirred a first wave of missionaries to the world’s coastlands, causing him to be credited as the father of modern missions. In the late 1800s, Hudson Taylor issued a challenge to the interior of China with an effect similar to Carey’s Enquiry. 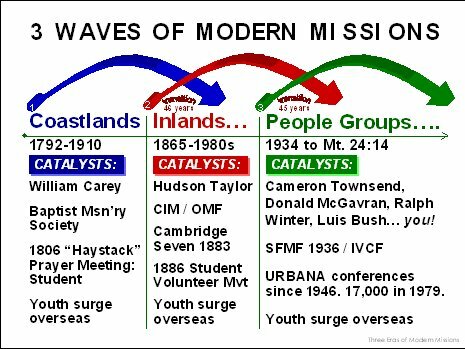 This stirred a second wave of missionaries to the interiors of the world’s continents and fueled the student volunteer movement of the late 1800s and early 1900s. Wesley, Carey and Taylor all contributed greatly to this increase of Christians, from less than a fourth of the world in 1800 to a full third of the world by 1900, and set the stage for the globalization of the Church. Ralph Winter estimated that, in 1900, 7.5% of Christians16 were committed believers (40 million people). 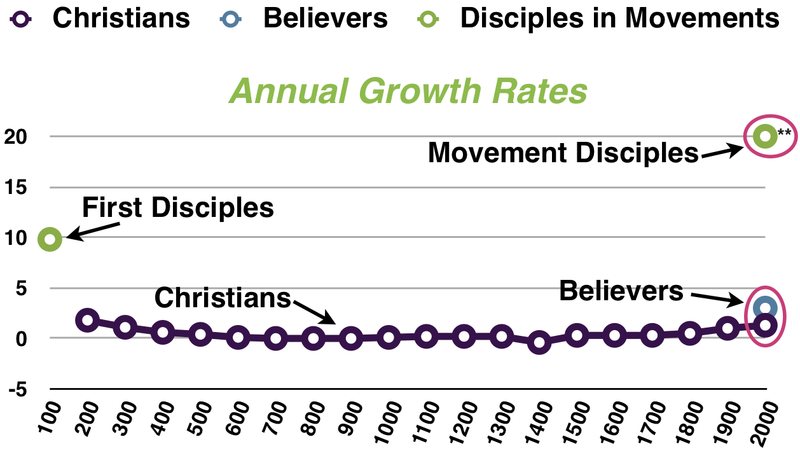 Between 1900 and 2000 the Evangelical, Charismatic and Pentecostal movements renewed the faith of many, so that today about a third (33%) of the world’s Christians17 are committed believers (850 million).18 And in just 25 years, movements have added another 50 million disciples, with experience in multiplying movements. 16 2.5% of world population. 18 11% of world population. 18 My estimate is based on published figures and interaction with researchers. In the 1960s, Donald McGavran launched a graduate school at Fuller Theological Seminary for experienced missionaries to study together how God had worked in their respective fields.17 This collaborative learning environment yielded many important insights. 17 McGavran’s original School of World Mission later opened its doors to aspiring missionaries and became the School of Intercultural Studies. Reached People groups (15%) accept believers as part of their people. UPGs (85%) need a movement before believers will be accepted. Winter and McGavran urged the launching of movements as God’s means for reaching UPGs, but the problem (peoples isolated from the gospel) was understood and embraced far more widely and rapidly than the solution (launching movements). Thus, McGavran lamented in 1981 that 90% of missionaries among UPGs were not pursuing movements.20 A former student of McGavran’s told me he later regretted advocating church growth rather than church multiplication. “World Christian Foundations” (an MA program), etc. Alongside the strategy coordinators who were trained during the 1980s and beyond, alumni of these courses have become like Gideon’s mighty men—revealing God’s power through their disproportionate impact. By the year 2000, perhaps 1,000 missionaries21 were pursuing God for movements among UPGs. As God blessed their efforts, they learned from each other’s successes and failures, leading to multiplying movements that today may rival or even surpass first-century growth. 21 My own rough estimates. Ying and Grace were church planters. Each year, they would win 40–60 people to Christ, organize them into a church, then move to a new city. At the end of ten years, if each of these churches had doubled in size, this could have produced 1,200 new believers. Then Ying was asked to take responsibility for an unreached population of 20 million. In the year 2000, Ying and Grace were trained in movement principles and began training disciples to start multiplying ekklesia. 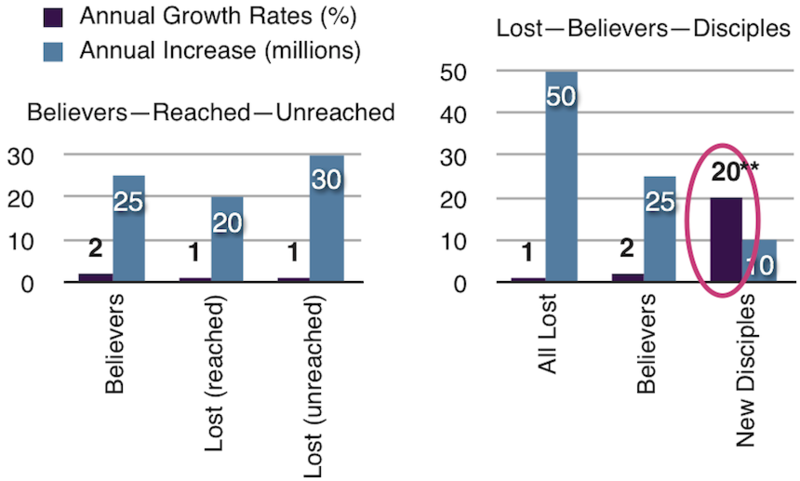 Over the next decade, 1.8 million new disciples were baptized and discipled using a discovery Bible study approach, and ekklesia multiplied to 160,000 with an average annual growth rate of 50%!22 Researchers who later verified this movement with a field assessment team found that these numbers had been consistently under-reported. 22 T4T: A Discipleship Re-Revolution: The Story Behind the World’s Fastest Growing Church Planting Movement and How it Can Happen in Your Community! by Steve Smith (MultMove.net/t4t). 23 Watch for books “for movement activists” by Trevor. God reserves a rare depth of fellowship for those who engage in a grand purpose together. Our intimacy with God and answered prayer are both tied to bearing multiplying fruit (Jn 15:7–8, 15–16). I have called you friends, for everything that I learned from my Father I have made known to you (Jn 15:15). God wanted … His purpose very clear to the heirs of what was promised …(Heb 6:17). This good news of the kingdom will be preached … as a testimony to all nations … (Mt 24:14). As we go to disciple all nations (Mt 28:19), we rest in the reality that He is with us to the end of the age (Mt 28:20). The distribution of multiplying ekklesia remains very uneven. The 24:14 Coalition invites you to help address this injustice. 24 See the May/Jun 2016 Mission Frontiers on the No Place Left movement. I am sending you to them to open their eyes and turn them from darkness to light … (Acts 26:17–18). Let a new generation of darkness hunters arise to bring forth movements in every people and place still waiting in darkness. When these things begin to take place, stand up and lift up your heads, because your redemption is drawing near (Lk 21:28). 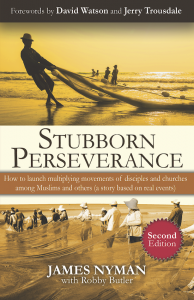 Pray persistently for the Holy Spirit to make you a “fisher of men,” one who makes disciples who make disciples. Get the free M28 app or visit m28global.org and seek the Lord’s guidance in starting a discovery Bible study that leads others to start other studies. Refine your skills through face-to-face or on-line training (MultMove.net/training or ZumeProject.com). See the May/Jun 2017 MF about Zumé (MissionFrontiers.org). Read the Jan/Feb 2018 Mission Frontiers about the 24:14 Coalition (MissionFrontiers.org), and join the 24:14 Coalition (2414Now.net). 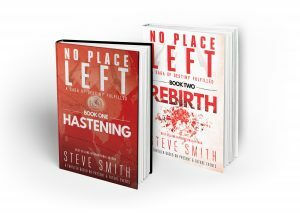 Read No Place Left—a thriller saga (Hastening and Rebirth) of how movements are multiplying globally. (Get your free copy at NPL2025.org/review-copy). Take the Perspectives course to see how movements fit into the BIG picture of God’s purpose: Perspectives.org (on-line or at a location near you). Get a free book and join the learning community at Multiplying Movements (MultMove.net). Share in blessing a Frontier people (MultMove.net/join-gcc).